Most of you will know that when Em first recorded Hailie's Song, he sang & rapped over a famous Beatles song, Whilst My Guitar Gently Weeps.. But because the sample didnt get clearance, he had to re-do it. "I made it just for Hailie. I'm singing on it, or trying to. I wasn't going to use it, but I played it for a few people, and they really liked it. A few of them cried, actually". "From what I understand, (George Harrison) heard it before he passed and liked it. I don't understand the political side, but his wife has control of the music now, and she said no, so I had to re-sing it all and redo the song". Many of us have often wondered what the original version would have sounded like, and after hearing a few poorly done versions over the years, I thought id have a crack at it. Bass - Paul McCartneys Bass line taken from the While My Guitar Gently Weeps Multi-Track. Guitar - Eric Claptons Guitar, again taken from the original Multi-Track. Kick/Snare - Eminem - Hailie's Song (Album version). Piano - Sampled from a classical cover of the WMGGW Song. 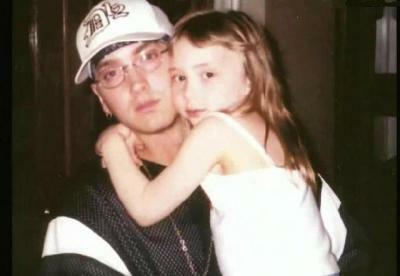 Vocals - Eminem - Hailie's Song (Studio Acapella). Hopefully a few ppl will like it, either way it gives us an idea of how Em wanted the track to sound. i always thought it was an Elvis Sample ? Oh god this is amazing, if only we could hear the singing over the real original which would have been in tune, but to be honest it's kind of like listening to email now, you've got to listen to it a couple of times and it sounds great, it also makes it hilarious when he says "I can't sing"